Extremely versatile and easy to grow, no garden (no matter how small!) is complete without a few herbs. Herbs add beauty, colour, texture, and fragrance to a garden and have many uses from medicinal benefits, to adding intense and unique flavours to foods. Even if your garden consists of a few pots on patio, herbs are a great choice for small spaces! To save space when planning your herb garden, why not go vertical? We like this upright plant stand / room divider from Ikea. 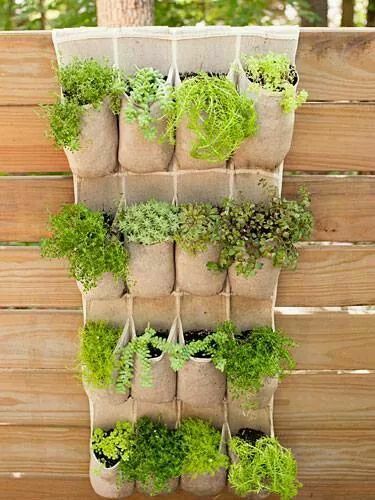 You can also get creative and repurpose any ol’ item like this Shoe Organizer Garden we found on Pinterest. Traditional pesto calls for Basil, Pine Nuts, and Parmesan but you can experiment with substituting different herbs, nuts and cheeses to add your own unique twist. For example, you could try swapping fresh Oregano with Walnuts and Grana Padano… really, the combinations are endless! Pulse ingredients until combined in a food processor or blender. You can go for a grainy or smooth texture depending on your taste. If you are finely chopping with a knife, make sure it is precision sharp to avoid blackening the basil. Now serve as a mouth-watering dip with fabulous bread, or use as a marinade, condiment, or salad dressing and sit back and wait for the compliments to pour in! Another vibrant and extremely versatile sauce; Chimichurri is an Argentinean delight usually accompanying grilled steak. But don’t just stop with steak, use it is as a substitute for your usual oil and vinegar dressing, for dipping bread, on chicken, seafood and potatoes. Your mouth and those of your guests will thank you! In fact, why not make an extra big batch and bottle some to give out as your party favours?! Wizz everything in a food processor or blender until smooth, slowly adding the olive oil in very last. Nothing knocks the heat back like an iced cold glass of the Deep South. Whether you choose to serve your version sweetened or straight up, the refreshing flavour of mint will delight your senses and further help to cool and soothe. handful of mint, stems removed. Heat the water to just before boiling, add tea bags (and optional sweetener) and brew for 5 minutes. Remove bags and chill. Once tea has cooled, add mint leaves. Give them a little ‘slap’ first in the palm of your hand to release the oils and flavour. For extra colour and flavour you may also add a few lemon slices. Soothing Lavender: to alleviate stress, place lavender flowers (fresh or dried) in a bath or add some to your favorite tea. Inhale the aromas and let the day unwind behind you. Herbal Honey: seasonal cold got you down? You may try this all-natural elixir: Loosely chop a handful of Lemon Balm and Thyme, place in a glass jar, cover in honey and seal. Allow the herbs to infuse the honey for about 2 weeks. Store in the refrigerator once infused. You can eat it straight like a cough syrup, or mix a heaping spoonful into some hot water. Sage Smudge: the practice of burning Sage is an ancient ritual for purification. It is said to clear and remove negative energies from people and their environments. You can make your own Sage smudge by bundling the leaves tightly together and tying with some string. Hang and allow the leaves to dry completely. When you are ready to use simply ignite, blow out the flame, and allow the smoke to linger around the person or object you wish to purify. This entry was posted in Blog and tagged growing herbs, herb garden, Herb uses, herbal remedies, medicinal uses of herbs, recipes with herbs on June 27, 2014 by Janine Keller.